The Walking Dead's taking some risks this season, not so much in the way it has divided its characters, resulting in episodes that only focus on one small part of the fractured group. We saw that formula at work at the end of last season. Season 5 has taken that a step further, however, as the timeline has been tinkered with, in order for us to see how certain events played out a bit at a time. Maybe they were doing that last season, but I'm not sure it was nearly as noticeable. Given the choice between this format and episodes that try to check in with all of the characters, I much prefer how they're doing it. It keeps the focus on one set of challenges, allowing for fuller character development and story progression. With such a great ensemble, it would be a shame if the series wasn't able to find the time to explore what everyone's going through. And strangely, it's not all that difficult to keep track of the timeline and when all this is happening. It was three episodes ago that Daryl emerged from the woods at the church and called behind him for someone to come out. It's now probably safe to assume that person is Noah, who was introduced two weeks ago when we finally got an update on Beth. As it relates to tonight's episode, last week's ""Self Help" takes place somewhere in the near future, right? Regardless, the point is, gaps are being filled in. We now know that Carol isn't dead and she's probably not dying. (Well, hopefully.) She's injured though, and while she didn't volunteer to be admitted into the hospital, Daryl didn't fight to keep her from being taken. On Noah's insistence, he let Carol be "rescued." I actually found myself thinking that Carol and Daryl were simply too good at this life at this point. I think that thought popped into my head when Carol rolled down the van window and casually head-stabbed the walker that was getting in her face. She did it like it was nothing, which made me think this game may be getting too easy for these two. And then the show threw in some curveballs, courtesy of Noah, whose path crossed with theirs as Carol and Daryl were searching the city. He stole their weapons, unleashed a walker on them and took off, leaving the duo with a knife and a handful of bullets. Without a stocked supply of weapons, Carol and Daryl had to get a bit more resourceful, but they managed to survive numerous walker attacks and a drop off a bridge inside a van. That landing couldn't have felt good. Their second run-in with Noah was interesting, as they both had the option to kill him, or at the very least, leave him under a bookshelf to die. And though Daryl seemed happy to opt on the latter, neither followed through with it. And just think, if they had let him die, they wouldn't have gotten confirmation that Beth was in the hospital. And who knows what other information Noah will be able to give Daryl about that place to help them plan a rescue. I think many of us were hoping Daryl and Carol would have a run-in with Noah. That was a pretty obvious theory when we saw Carol wheeled into the hospital at the end of "Slabtown." But I doubt it was an accident that Noah's encounter with the duo proved to be a test of their humanity and character. Tonight's episode focused mainly on Carol, flashing back to moments we never saw. Carol standing by Karen and David's burning bodies. Her drive away from Rick when he sent her packing, and the alone time she experienced after that. And in the present(ish), she took Daryl to a shelter where she and Sophia once stayed at one point when Carol was being abused by her husband. I'm not sure my brain has put together all of the pieces of Carol, but it seems like The Walking Dead was intent on laying those pieces out for us tonight to show us who she is at this point in her life. In the wake of all of the losses and terrible choices -- RIP Sophia, Karen, David, Lizzie, Micah -- we're left to ask ourselves, who is Carol Peletier? Like I said, I don't have the answer to that question. But I do know that she's proven to be one of the most interesting characters in this series, and I really hope she pulls through these injuries and makes it out of that hospital alive. Carol appreciates art. And Daryl doesn't know everything about her. Daryl burned some bodies at the shelter. It seemed like more of a ceremonial gesture than a means of disposal. Was that a nod of respect to Carol for what she went through back when she first visited that shelter? Maybe in part. 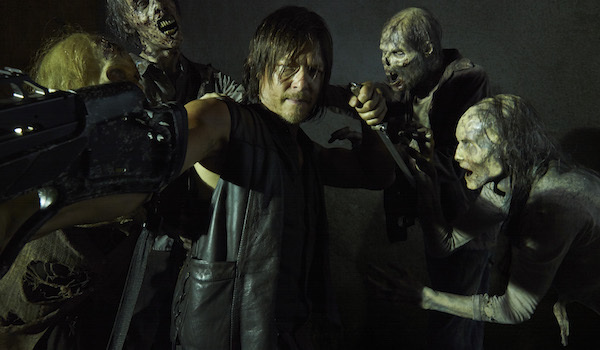 We know Daryl has his own rough past, which may have tied into his choice to lay those bodies to rest. I'm not sure, but I do think the scene exposed that subtle and often unspoken connection between Daryl and Carol.